With the relay race over and the gang’s bond tighter than ever, it looks like we’re safe to slip back into relaxed slice-of-life bantering and gradual romances…for all of half an episode, anyway. orange picks up the pace this week to take us from our highest crest straight into our deepest trough. For the first time, it feels like changing the future may not be a given after all. The first half of the episode is relatively peaceful and pleasant, with the gang hanging out and teasing each other, Kakeru and Naho flirting adorably, and Hagita and Azu joking their way into a relationship. 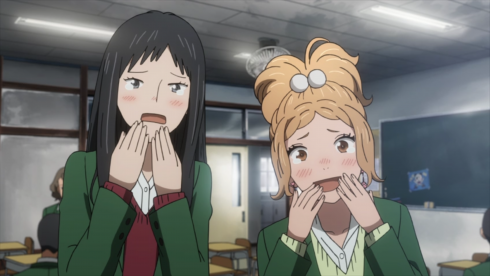 There is muted conflict, though, and a quiet sadness that runs through these early scenes via Suwa and the supporting gang’s concern for him. 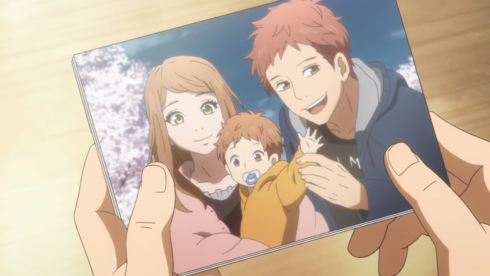 Glimpses into the future reveal that Adult Suwa feels he doesn’t deserve his current happiness–that he “stole” the life Kakeru was supposed to have. 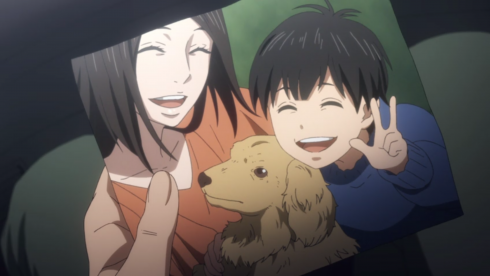 Naho assures him she’d have ended up marrying him regardless, but his letter to his past self (filled with photos and specific instructions on supporting Kakeru and Naho’s relationship) suggest he’s willing to test that promise. Naho’s letter has carefully avoided discussion of romantic feelings. She focuses on Kakeru and encourages honesty, but there’s the sense that she doesn’t want to influence her past self’s personal choices. 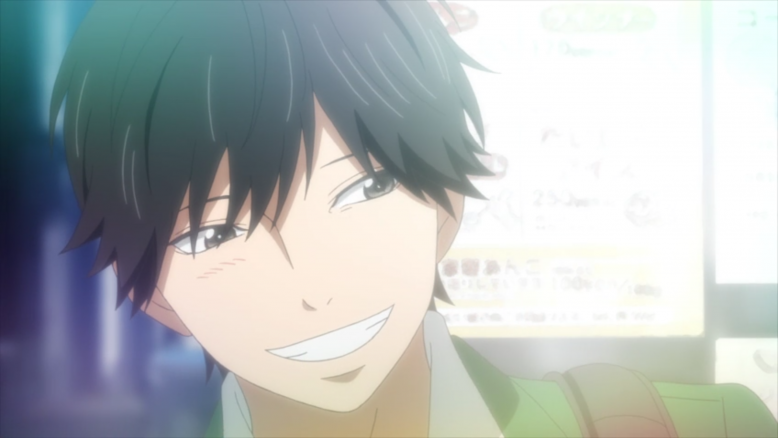 Suwa’s letter is much more vocal, because his regrets tie into the romance aspect more than Naho’s do. 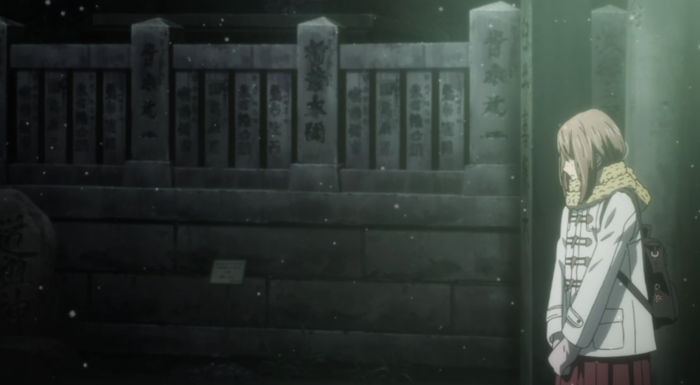 Our timeline’s Suwa winds up stuck between a rock and a hard place: Tell Naho how he feels and risk carrying the same regrets and uncertainties his future self has, or stay silent about his own feelings and risk one day regretting that he said nothing. His friends are more worried about the second one. Takako’s the most vocal, but Hagita has the most troubling point: The changes they’ve made might save Kakeru, but they can’t know for sure, and in the meantime they’re creating a ripple effect that may end up hurting others along the way. What about the kids who lost the race instead of winning it? And what about Suwa, who’s sacrificing his own chances with the girl he likes in the name of a future that may not even happen? It’s a complicated question, and one that orange wisely doesn’t try to answer. 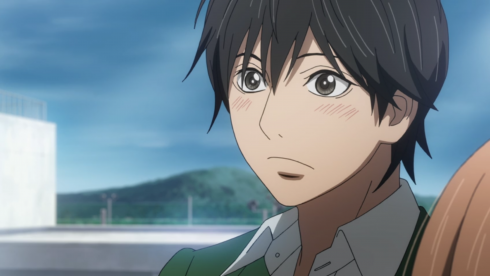 Suwa finds his own answer, though, as instead of promising to protect Naho, he promises to look after her and Kakeru both. And, you know, while I agree with Takako that honesty is important and Suwa shouldn’t do something he’ll later regret, I also don’t think Suwa made a wrong choice here. Right now, in this timeline, Naho and Kakeru have confessed their feelings for each other. His confession would be an intrusion on that budding relationship. Maybe Naho and Kakeru will work out, or maybe they won’t. But Suwa will never be able to put his future self’s insecurities to rest if he doesn’t at least give all three of them a chance to find out. The kicker this week is that Suwa’s decision may not have changed the future at all. 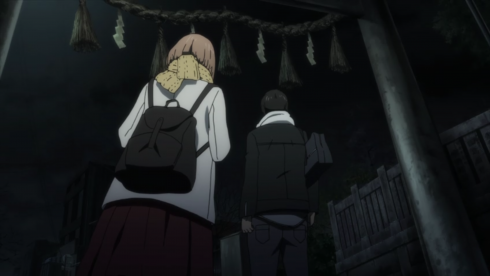 Naho does her best to avoid a fight with Kakeru, but she’s so nervou–and so tangled up in her own certainty in the letter’s promised future–that she winds up causing a different fight. 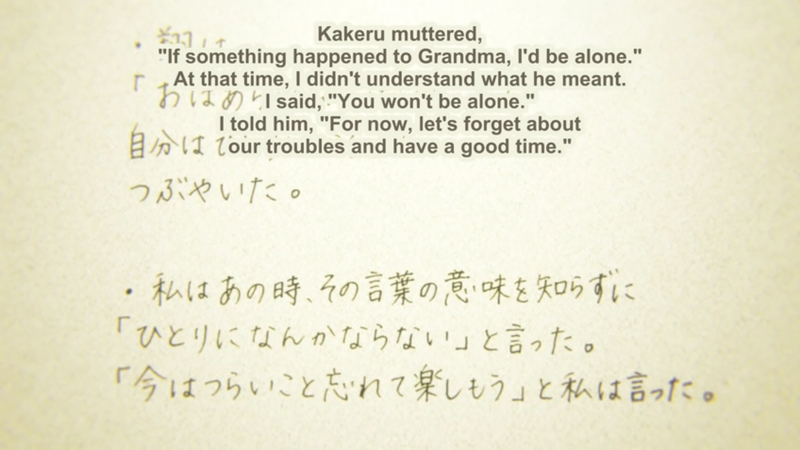 Future Naho’s mistake was that she tried to brush aside Kakeru’s troubles. 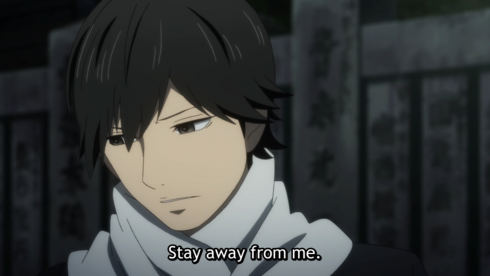 Present-Day Naho’s mistake is the opposite: She’s so worried about Kakeru that she won’t let go, asking him to stay with her even after he specifically says he needs some space. 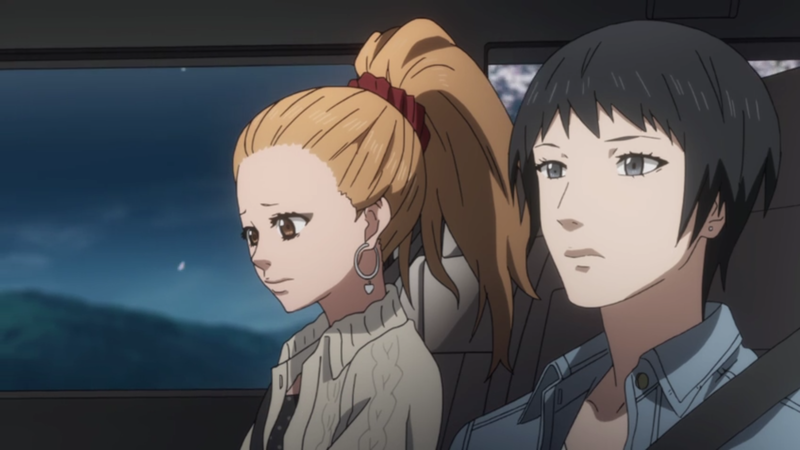 There’s always been the chance that Naho and her friends would push too hard, ignoring boundaries out of fear for Kakeru’s life, and I think we see that happening here. Just as it’s important to reach out, it’s also important to know when to back off. 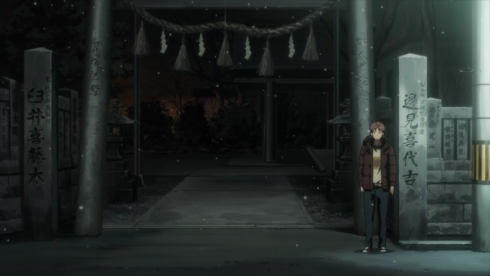 Communication is an issue here too, of course–Naho keeps insisting Kakeru’s grandma will be fine but can’t tell him why, and instead of saying she’s worried about him she just insists that he stay, making it seem like a selfishness rather than concern–but the main problem, I think, is that both versions of Naho fail to really listen to Kakeru. She tries to do what she thinks is best for him (“forget your troubles”/”don’t be alone”) instead of paying attention to what he’s telling her he needs. 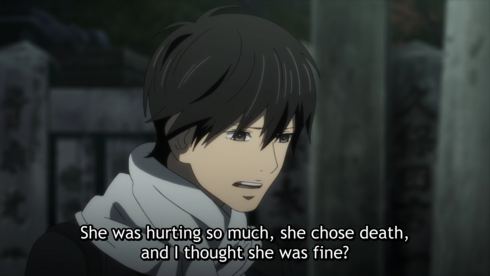 Of course, there’s a grimmer alternative here, too: That sometimes there is no “right” answer, and Kakeru was already in such a bad place that he would have gone home miserable–angry or sad, full of fear or guilt–no matter what Naho had said or done. There was probably a path that ended less destructively, but happily? He admits to Naho that he thinks he killed his mom because he didn’t notice anything was wrong with her. Which is heartbreakingly unfair, but more to the point, it’s not the kind of weight any one other person is going to be able to lift, no matter what she tells him. At the end of the episode we’re left with a lot of darkness and heaviness, and a lot of isolated kids. Suwa at the shrine, intentionally holding back. Naho running down the street, desperate to talk. 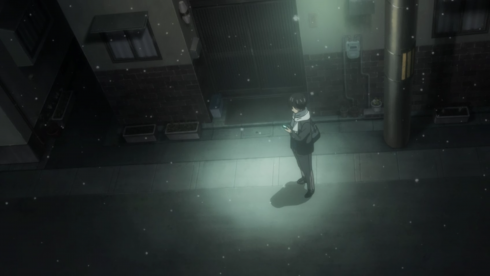 Kakeru standing over his smashed phone, refusing to connect. orange has never pretended that change was easy or that helping someone through depression or grief was simple, but it’s always carried a streak of optimism, a promise that as long as everyone kept reaching out to him, Kakeru would reach back. 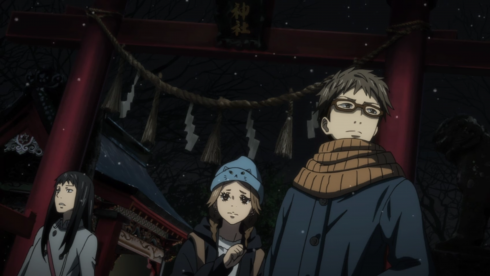 This week we see that narrative promise broken, and it leaves us as lost for answers as Naho. What do you do when someone rejects your outstretched hand? When your attempts to help aren’t enough? The “what if”s and “if only”s are piling up again, different than in the last timeline but there nonetheless. There’s no way to live a life free of all regrets. But to know your future regrets and still fail to erase them? If that comes to pass, that’d make this second timeline far more painful than the first. Azu and Hagita Rom-Com Spin-Off Movie. Make it happen, Japan. “I’m wearing a scarf, too…” orange isn’t a comedy by any stretch, but it handles its humor really well, and always manages to get at least one good chuckle out of me an episode. That’s a huge part of its charm, I think. Barring one Azu forehead situation, this episode looked gorgeous. Hopefully this means the creative team has pulled it together to give us two final episodes as beautiful as its story. The new ending art ran me through the gamut of emotions: The adults under a bare tree without Kakeru, then their teen selves under a green tree still without Kakeru, and then finally the whole gang under a blossoming tree, Kakeru present at last. Way to make me sad and scared and relieved all within about a minute and a half, you jerks. Scheduling Update: I’m off to London for a week-long holiday, and that includes all blogging assignments! I’d rather not roll orange‘s final 2 episodes and series review into a single post, so my plan is to get the Episode 12 write-up out when I get back to the states (maybe Tuesday, probably Wednesday). As always, I’ll keep you posted on Twitter, so feel free to follow me there for more. Talk to you all again soon-ish!